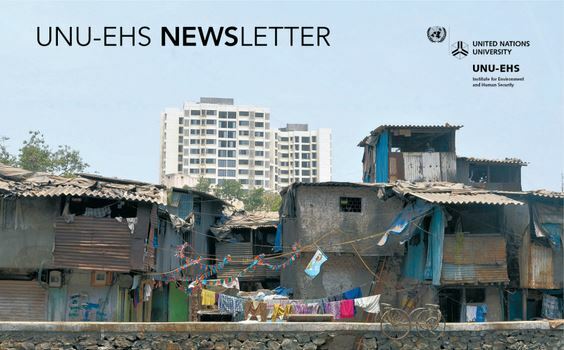 Welcome to the 3rd edition of the quarterly UNU-EHS e-Newsletter. An important year for climate action is coming to an end and here at UNU-EHS we reflect on the important milestones achieved and the work that lies ahead next year. Last Saturday, at the conclusion of COP21 in Paris, 195 nations adopted a new climate agreement leading the way to a more sustainable future. UNU-EHS was well represented at this monumental occasion, with UNU-EHS colleagues taking a leading role in hosting, organizing, and presenting at two press briefings and several side events on the topics of human mobility related to climate change and climate risk insurance. A press briefing presenting findings from the Pacific Climate Change and Migration Project (PCCM) generated media coverage that spanned the globe, including major news sources such as Reuters, the New York Times, Le Monde, DPA, Washington Post, Al Jazeera and Nature Magazine. At the same time, the Munich Climate Insurance Initiative (MCII) hosted at UNU-EHS, organized a high-level side event on climate risk insurance with speakers from the German Federal Ministry for Development and Economic Cooperation (BMZ), the German Development Bank (KfW) and Deutsche Gesellschaft für Internationale Zusammenarbeit (GIZ). In November we launched the World Risk Report 2015, which focused on the relationship between disaster risk and food (in-) security. The report placed food security within the context of the WorldRiskIndex which systematically considers a country’s vulnerability, and its exposure to natural hazards (e.g. flood, storm, earthquake) to determine a disaster risk ranking of 171 countries around the world. According to the index, the island state of Vanuatu once again faced the highest risk in 2015. Its ranking as the most high-risk country in the world was felt acutely when the country was devastated by cyclone Pam in March. This year’s report focused on food insecurity and concluded that hunger has negative effects on disaster risks because it causes a significant increase in the vulnerability of population’s to natural hazards. The joint Master of Science Programme “Geography of Environmental Risks and Human Security,” has had a busy year with students taking part in multiple hands-on field trips. In November they studied disaster response management at the Regional Emergency Dispatch Centre in Rotterdam, the Netherlands. Then in December students took part in a week-long seminar on civil protection at the Academy for Crisis Management, Emergency Planning and Civil Protection (AKNZ) in Bad Neuenahr-Ahrweiler, Germany. The call for applications for the 4th cohort of our joint Master of Science Programme is now open. The deadline for applications is 29 February 2016. Yesterday, UNU-EHS scientists presented the Global Delta Vulnerability Index (GDVI) for the first time at the American Geophysical Union (AGU) Fall Meeting in San Francisco. By examining three of the world’s largest deltas, the Amazon, Ganges-Brahmaputra-Meghna and Mekong deltas, UNU-EHS researchers have developed a framework and methodology that can be used to assess how vulnerable delta´s social-ecological systems are to natural hazards such as sea-level rise, salinity intrusion, flooding, drought, cyclones, and pollution. I would like to thank you for following our work in 2015 and we at UNU-EHS look forward to many engaging interactions in the next year. I wish you and your family a happy holiday season and invite you to visit our Twitter, Facebook and Website channels for regular updates on UNU-EHS events, announcements, vacancies and research.